Justin touched many people during his lifetime. His strong personality and love of life was as contagious as his smile. The fund was originally established in Justin’s memory to support the children he left behind – Alanna & Nathan. But since Alanna and Nathan have not needed any of the funds raised, we continue to keep Justin’s memory alive by helping other families that are residents of Maryland who have suffered a similar loss and whose support system may not be as strong as Justin’s. Keeping Justin’s memory alive is very important to us. Justin touched many people during his lifetime. His strong personality and love of life was as contagious as his smile. But Justin’s road wasn’t always an easy one. In August of 2002, while performing professional street bike stunts, Justin suffered a head injury that almost took his life. After months of hospitalization, rehabilitation and multiple surgeries Justin made a miraculous recovery. Justin went on to marry and have two beautiful children, a legacy he would leave behind just 9 years later when a fatal motor vehicle accident claimed his life. We often think it’s cruel to lose someone twice, but we are grateful for the babies he’s left behind. That’s why this fund is so important to Justin’s family – it’s keeping his memory alive by helping those that may not be as fortunate as we have been or have the same support system we’ve been blessed with. We need your help to continue this mission and to keep Justin’s spirit alive. We all learned many things from Justin during the time he was with us, but the most important lesson he left us with is to ‘live life throttle wide open’. Kiree lost his dad in a Motorcycle accident in the beginning of May 2013. 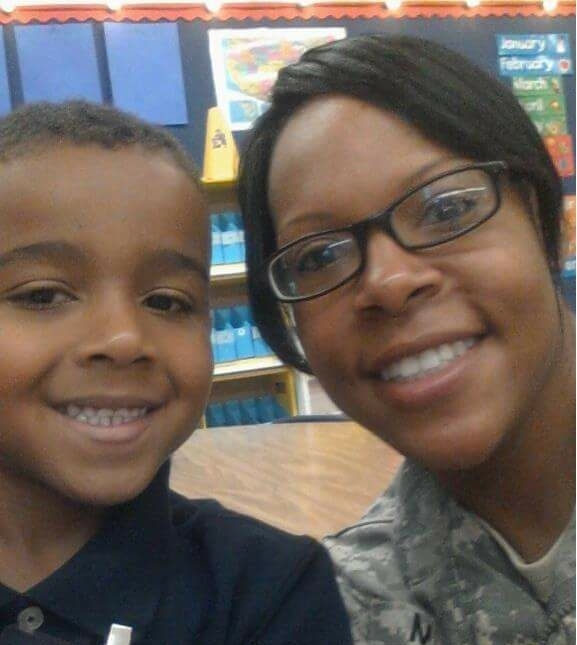 His mom, Andrena, is in the military and stationed in Texas. Kiree is the reason we do what we do and why your support is so important. Because of your generosity, we were able to help Andrena keep Kiree in daycare during this difficult time by providing them with daycare assistance. JFMF supporters have made this possible! Thank you from the members of the Fund, the members of the Family, and a very special 'Thank You' from Kiree and his Mom, Andrena! This beautiful, bright-eyed little lady is A'dyn, or ‘Tulip Pot-Pie’, as her family calls her. She lost her Daddy in a motorcycle accident. Her Dad, Caleb, sounds a lot like our Justin! Caleb affectionately known as “Scrappy” was a member of the Azphalt Raiderz Motorcycle Club. Caleb a Veteran of the US Navy and served in the field of Nuclear Engineering. During his career in the Navy, Caleb attained many Welding and Mechanical Engineering certifications that required him to perform his job to Military Specifications. Caleb was later deployed to the Iraq War aboard the USS Harry S. Truman. He later completed his military service and received an honorable discharge in 2007. In addition to his military service, he continued to work a myriad of positions that allowed him to continue to hone his skills while dedicating his life and time to God, family, fellowship, friends and Motorcycles. Caleb truly loved his family. He was one of the kindest, most caring people you could meet. Caleb never met a stranger. He had strong faith, a big heart, and an infectious smile – like our Jus whose memory our purpose serves. When we heard of Caleb’s passing we reached out to his wife, Crystal, to see how we could help support their daughter A'dyn. Thanks to your continued support we are providing assistance with child care for A'dyn in the memory of our beloved Justin Fishell. Meet the Radcliffe children….ages 12, 4 and the twins are 2. Their Daddy, Mike was in a Motorcycle accident last June which claimed his life. Their Mom, Nikki, has been left to raise their children on her own. Mike was their provider and times have been tough for Nikki and the children. Through our wonderful network, Nikki was able to learn about us, the Justin Fishell Memorial Fund. Our fund helps aid with the daily living expenses of children who have lost a parent in a fatal vehicle motor accident. The JFMF helped Nikki pay off her outstanding BGE bill. With a winter like we’ve had we hope we helped Mike & Nikki’s children stay safe and warm, and that we’ve given Nikki a little peace of mind knowing there are people out there that care! Immediately following our 3rd Annual Crab Feast event the JFMF were called to action...This is 2 year old Brooklyn and 12 day old Jaxon. On Saturday, July 26, 2014, their Daddy, TJ was in a motorcycle accident. TJ was airlifted to University of Maryland Shock Trauma Center in Baltimore, MD, with life-threatening injuries. He was dead upon arrival to the hospital, but the trauma team was able to revive him. However his injuries were extremely extensive.Initial prognosis was that he would have a very, very long road of recovery in front of him. It was anticipated that he would be in the hospital for at least a year. Unfortunately, things did not work out that way. Despite emergency surgery to remove a large part of TJ's skull to remove pressure on his brain, the family was told that TJ's brain continued to swell, parts of his brain had stroked out, his pupils were non-responsive, and the ventilator was doing all the breathing for him. The family was told this was a non-survivable injury. TJ was given last rights and was pronounced at 3:40 p.m. on Wednesday, July 30, 2014. This story was so much like our very own family's story with Justin, we knew we just had to help. The JFMF is proud to issue a grant to Brooklyn & Jaxon and have hereby helped with their family's mortgage. God bless TJ's children and may they always hold their Daddy in their hearts.